Core Swap is an installation of two aluminum plates that mark the location where earth cores have been drilled from the ground at Socrates Sculpture Park. A truck-mounted auger was used to bore down to a depth of 12′ and the samples were then exchanged, filling the cavity left by the other drilling. The Broadway Billboard is a proscenium opening onto the location and activity of the event. 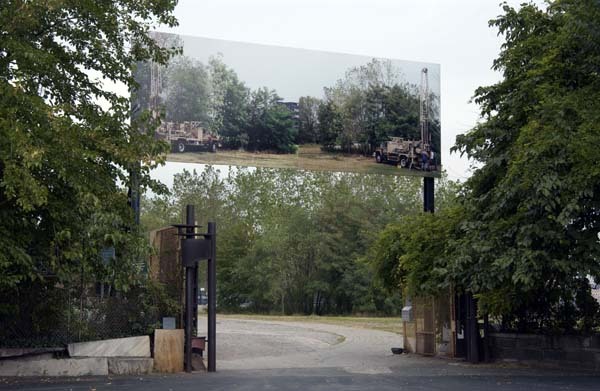 The image is a mirrored depiction of the same truck and crew drilling at the two different sites in the Park, printed on a 10′ x 28′ seamless vinyl billboard.